Carroll Painting is an A+ rated business with a 5 out of 5 star rating. BBB maintains business reviews on more than 4.5 million businesses and rates them based on complaint histories, responsiveness to customers, licensing, legal and government action, and other factors. Only Accredited Businesses that meet the BBB Code of Business Practices are permitted to display the BBB logo in their marketing and place of business. Carroll Painting is proud to be named one of the top 3 Painters in Colorado Springs for 2018. 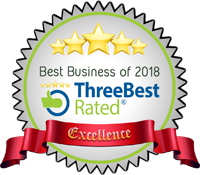 Three Best Rated was created with a simple goal to find you the top 3 local businesses, professionals, restaurants and health care providers in any city. Three Best Rated checks each business's reputation, history, complaints, ratings, nearness, satisfaction, trust, cost, general excellence and reviews using their 50-Point Inspection, and handpicks the top 3 local businesses. Porch is the free home network that connects homeowners and renters with the right home service professionals based on who neighbors have used, project and cost history, and friend and neighbors' endorsements. Carroll Painting is proud to have received the Angie's List Super Service Award for 2016 and 2017. For over two decades, Angie's List has provided trusted reviews to help millions of consumers make informed and confident hiring decisions when it comes to local service providers. Carroll Painting was recognized by the Houzz community as "Best Of" for client satisfaction in 2017 and 2018. Houzz is the leading online platform for home remodeling and design, bringing homeowners and home professionals together in a uniquely visual community.